After a pretty busy day yesterday, our final full day in Berlin was a lighter one, which was fine for both of us. We had actually already seen most of what we wanted to see, so we were able to focus on a smaller list, mostly of things to walk through/see in passing rather than spend a lot of time on, so we could move through the day at a pretty leisurely pace. 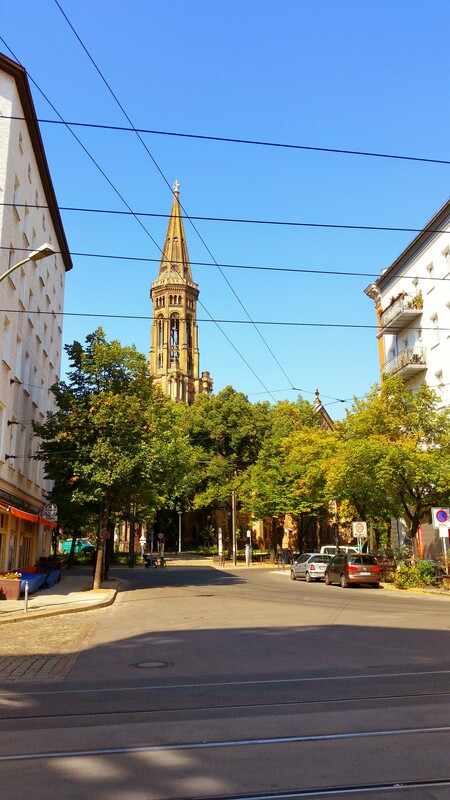 First on our list was a neighborhood, Prenzlauer Berg. We heard about it through a friend of Scott’s who has lived here for awhile, so we decided to meander towards it. Although it wasn’t a long walk (about two miles or so), it was nice to get a little ways out of the city proper to get a feel for what some of the neighborhoods in Berlin look like. This particular one is known for being a bit bohemian and a haven for artists and other creative types. It felt like a nice, comfortable neighborhood and the sunny, warm weather was perfect for exploring it. 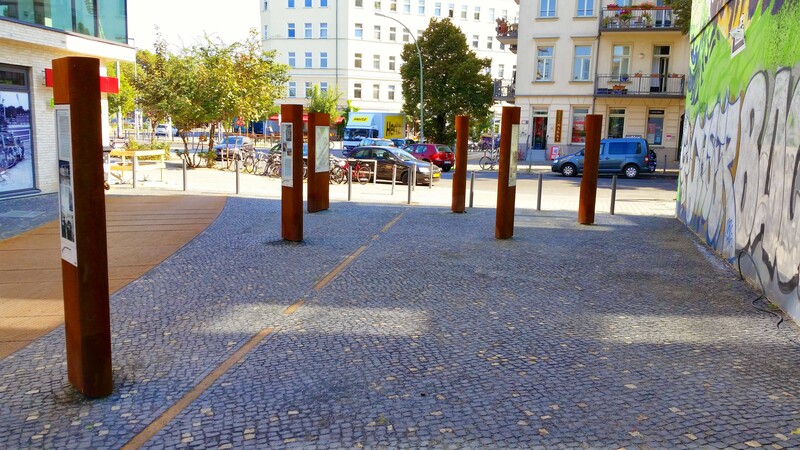 This neighborhood is also home to Mauerpark, which was another destination on our list. Although as parks go, there’s nothing particular amazing about it as it’s built in a very linear fashion and isn’t especially lush, it is significant because it was part of the Berlin Wall and the associated death strip in East Berlin (Mauerpark actually translates to Wall Park and there’s still a section of the wall standing in the park today). 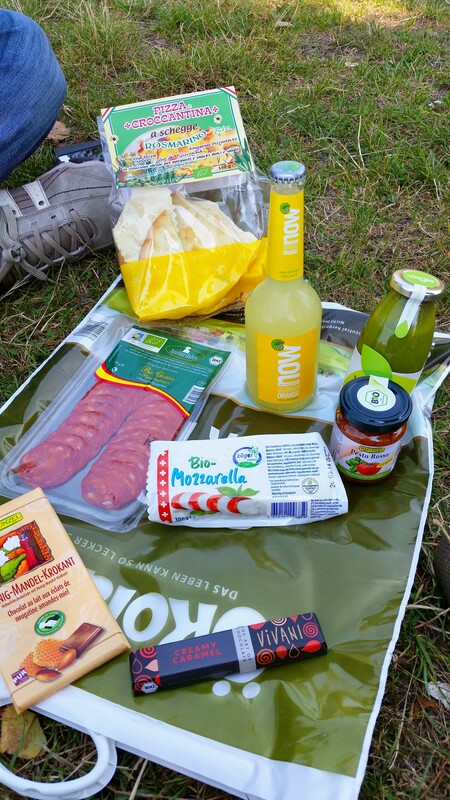 We walked down a couple of streets near the park and, since the weather was so nice, we decided to stop by a local market to buy some food for a picnic, which we enjoyed in the park. Having picnics isn’t something I do at home, not because I don’t enjoy them, but because it’s just not something I ever do. There’s something special about doing it on vacation, in a park in a city you’ve never been to before though. Since there weren’t many people around, we were able to find a nice shady spot and enjoy our food. A word of caution though – it didn’t seem like the park was especially clean and there weren’t a lot of benches/places to sit, so you’ll just need to find a spot on the grass if you want to relax here for a bit. Alternatively, you could visit on a Sunday and go to the big flea market, which I’m told is great! Our final destination of the day (I told you it was a light day!) was the Gendarmenmarkt, a famous plaza in Berlin. 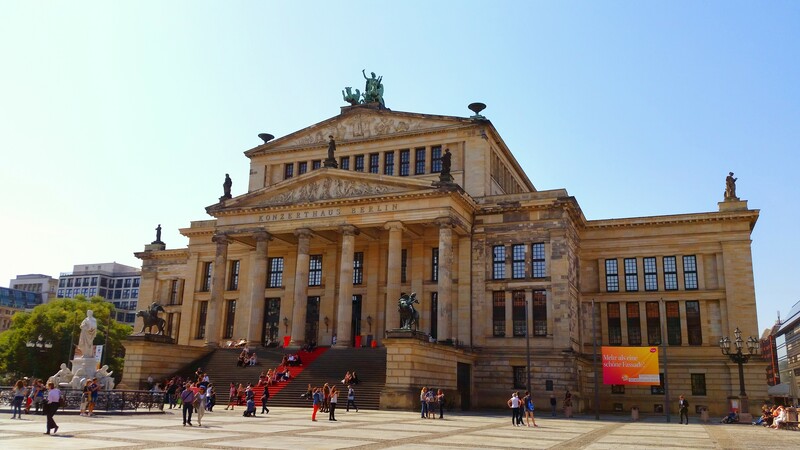 It’s well-known for its trinity of important buildings – the Deutscher Dom, Konzerthaus (concert hall), and the French Cathedral (though not a cathedral as you would typically expect). 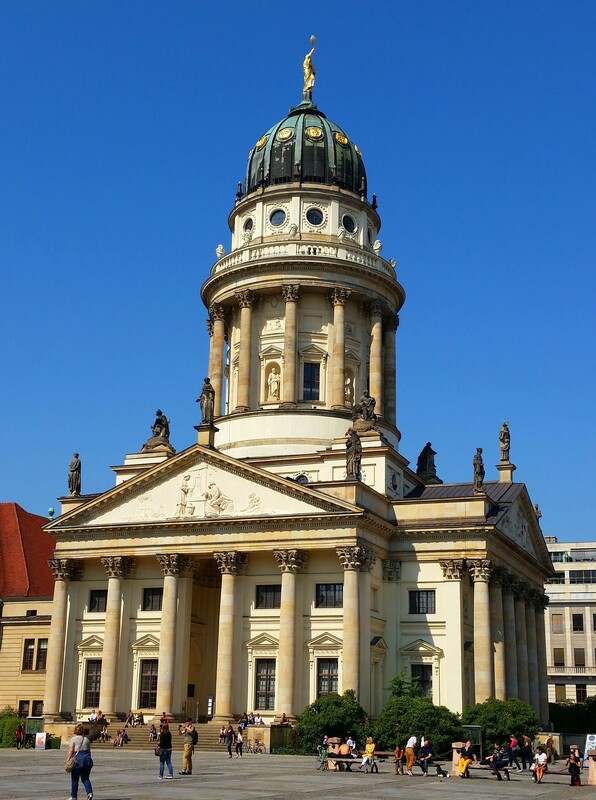 We did peek into two of the buildings – the Deutscher Dom and the French Cathedral. There’s a nice observation spot at the top of the French Cathedral, but it was closed when we were there, so we didn’t get to take advantage of it. Both this building and the Deutscher Dom were heavily damaged over the last century, so have been extensively restored. Still, this plaza is an excellent place to sit on the steps of any of the three buildings (a great way to get some shade on a sunny say) and just watch the world go by. When else do you get the chance to do something like that? Fewer things to do means fewer pictures, but I think there are still some good ones here. Judge for yourself though! A nice photo opportunity while walking around Prenzlauer Berg. Several informational signs near Mauerpark explain its history. 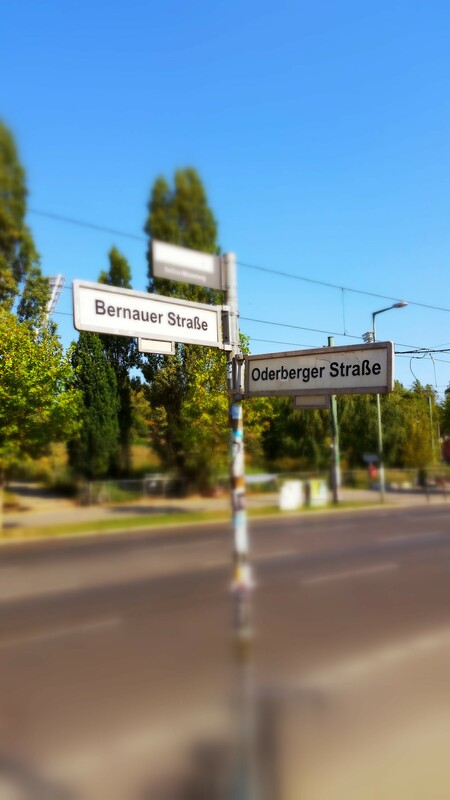 The intersection just in front of Mauerpark. 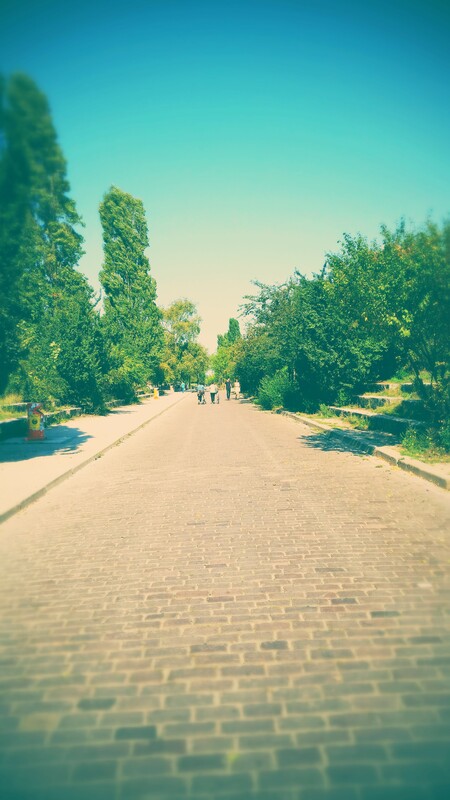 A nice walk through Mauerpark, almost liked walking along a tree-lined avenue in a city like Paris. 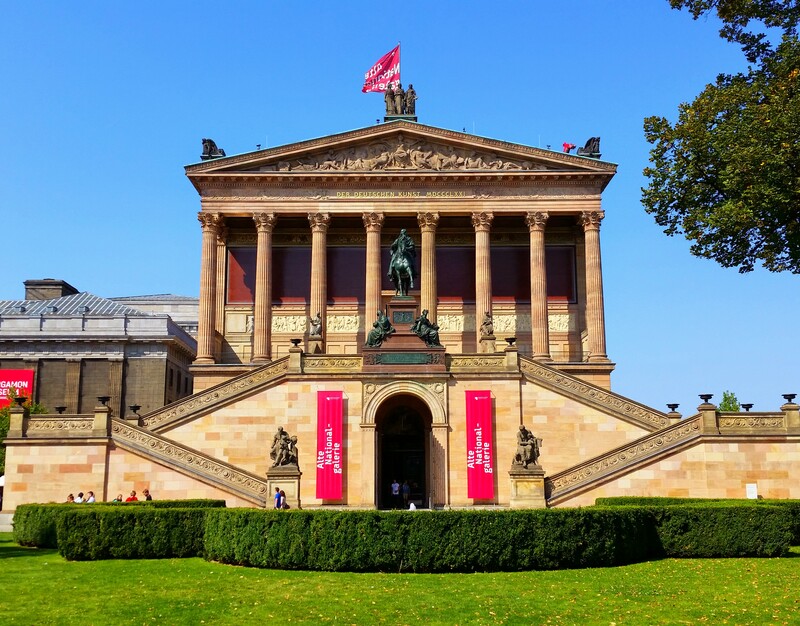 The Alte Nationalgalerie on Museum Island. A nice panorama showing all three buildings in Gendarmenmarkt. Tomorrow, it’s off to Prague! We’re catching a train around 1045a, so we won’t have to get up early. It’s a five-hour train ride though, but I’m hoping we’ll at least have some nice views from the windows. See you in the Czech Republic! I’m also a “drive-by” art museum gal. Know yourself, and do what you want – after all, it’s your vacation! Interesting tidbit about having to ask for the bill in restaurants in Europe; I didn’t know that. Is the same true for cafes?